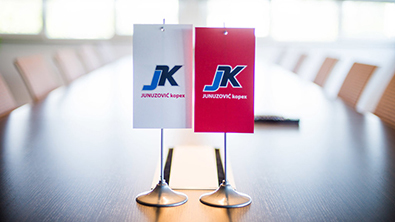 Junuzović Kopex is a company established in 1996 in Lukavac and a 100% private property. Our initial business ventures were in the field of travel network construction, production of concrete and transportation service. After some time we have profiled in the field of oil and oil derivates transportation (wholesale and retail), providing transportation service as well as providing the service of construction machines. The company currently employs 112 people and its goal is to expand human and technical resources. In 2014, we have expanded our business into providing transportation services and that is when Junuzović Kopex became the majority owner of the Gradski i prigradski saobraćaj Tuzla and Litvatrans Banovići. We aim at investment in the revitalisation of company and the improvement of its services. Companies that are founded to provide services to their citizens have to bring the same citizens back into the focus of business and that is exactly what GIPS Tuzla and Litvatrans Banovići have done. Then, Junuzović Kopex immediately invests in the modernization of its new company’s equipment which combined with the staff training directly adds to the quality of provided services. Today, GIPS DD Tuzla is an example of a successful company that goes further by introducing the first and the only busses in Bosnia and Herzegovina that use natural gas for the engine drive – CNG busses. Apart from their own needs for the CNG gas, on October 24th 2016 company Junuzović kopex has become the owner of a CNG terminal with its headquaters in Sarajevo. This CNG facility also represents the wholesale distributive center of CNG which demonstrates the aspiration and business intentions regarding the further development of this project. Junuzović Kopex’s terminal Reljevo in Sarajevo is able to offer perfect conditions for providing this energy source which is in the economically cost-effective sense the best alternative to other energy sources. At the beginning of May 2017, Junuzović Kopex Lukavac has opened a CNG gas station for retail purposes, for the citizens, more likely for car owners whose vehicles are run by CNG natural gas. Our initial business ventures were in the field of travel network construction, production of concrete and transportation service. After some time we have profiled in the field of oil and oil derivates transportation (wholesale and retail), providing transportation service as well as providing the service of construction machines. In order to achieve the Mission and reach the Vision it is neccessary to subject one’s behaviour to the expectations and goals of everyone interested in the work of Junuzović Kopex and those are buyers, suppliers and the community where we work. Junuzović Kopex d.o.o. Lukavac is an important participant in oil and oil derivatives market, transport services, construction machines services in the Federation of Bosnia and Herzegovina. Our mission is to provide each customer with the best value through product and service quality and the pleasure of purchase with constant business improvement. Junuzović Kopex d.o.o. Lukavac is going to be the top bidder in Bosnia and Herzegovina in its field and with constant service and product quality improvements it will answer the market’s demands, offer their customers more than they expect, be a desirable employer to its employees, a reliable partner to its business subjects and a socially responsible company. "For 20 years we have been working hard to be a reliable partner and a safe employer."